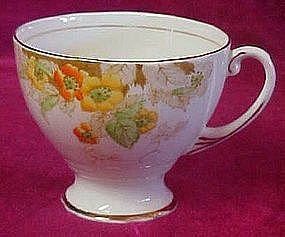 Pretty and dainty single cup, with fancy delicate handle and gold trims by Royal Standard bone China England. Pretty decoration of yellow and orange blossoms among leafy foliage. Measures 2 3/4" tall. Pristine condition. Hand decorated.